The FIH (International Hockey Federation) have published the new Rules of Outdoor Hockey, which will take effect internationally from 1st January 2017. Download the Rules of Outdoor Hockey 2017. In summary, there have been no major changes to the Rules of Hockey 2015 and the subsequent adjustment to Rule 13.2, which came into force February 2016, has now been formally incorporated. 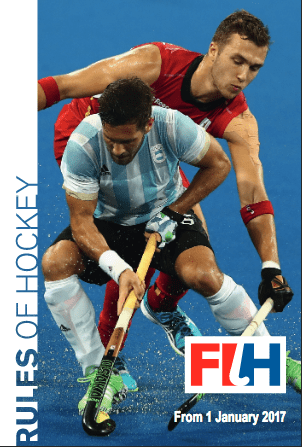 The Rules of Hockey 2017 do contain a number of adjustments that feature in the already published Rules of Indoor Hockey 2017, as applicable to the outdoor game. The outdoor rules changes are all indicated by a vertical line at the left side margin against the relevant text in the Rule Book. They are summarised below, but players, coaches and umpires are encouraged to read the full text of the new rules rather than relying on this post. The FIH believes that it is crucially important the both sets of rules are aligned as closely as possible and, in keeping with that philosophy, has included these adjustments in the Rules of Hockey 2017. Rule 1.10 – No equipment etc. to be placed inside the goals. Rule 2.1 – Clarification that decisions taken prior to correcting a team having more than the permitted number of players on the pitch cannot be changed if time and/or play has already been re-started. Rule 2.2 – Clarification that any change between goalkeeping options, even for Players with Goalkeeping Privileges, either on or off the pitch, must take place as a substitution. Rule 4.2 – Change of the description of ‘gloves’ to ‘hand protection’; specification of the size of hand protection which may be used, both for normal play and to defend Penalty Corners; addition of guidance regarding the use of knee pads when defending Penalty Corners. Rule 4.3 – Deletion of ‘single’ in colour of Goalkeeper shirt. Rule 9.8 – Adjustment to the guidance to ‘A ball is also considered dangerous’. Rule 9.16 – Addition into guidance that if a ball hits discarded Penalty Corner defence equipment then a Free Hit will result if outside the circle or a Penalty Corner if inside the circle. Rule 13.2 – The changes to Rule 13.2, which were posted to the FIH website on 16 February 2016 as an adjustment to the previous Rules, are now formally incorporated. Rule 13.7.d – Tidying up of two paragraphs of repeated guidance concerning the completion of Penalty Corners. Rule 13.8.e – Addition of ‘once the whistle has been blown to start the Penalty Stroke’ for no movement of the Goalkeeper’s feet at a Penalty Stroke. Rule 13.10.d – Adjustment of the guidance for the caution/carding procedure for a Goalkeeper moving early at a Penalty Stroke, bringing it into line with the Indoor Rule. Appendix 4.3.c – New ‘Corner’ signal in the Umpiring. Ball out of play over the back-line unintentionally by a defender: using right or left arm as appropriate, with the arm well below shoulder level, draw an imaginary line from the point where the ball crossed the back-line to the point on the 23 metres line from which the re-start should be taken. This document of FIH Outdoor Umpires Briefing 2017 might be helpful for Umpires.